TOKYO — Japan posted a trade surplus of 513.5 billion yen ($5.1 billion) in July, though exports sank 14 percent from a year earlier as the yen surged against the dollar, the government reported Thursday. The fall in exports by the world's third-largest economy was outpaced by a nearly 25 percent drop in imports, suggesting persisting weakness in domestic demand. Both were the sharpest monthly year-on-year drops since 2009. 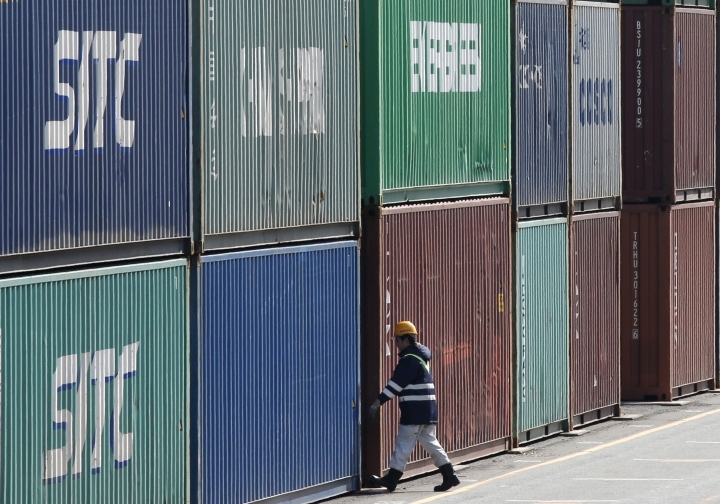 Japan posted a trade deficit of 261.4 billion yen in July 2015. The recent rise in the value of the Japanese yen, to about 99 yen per U.S. dollar, has helped reduce costs for oil and gas imports. Japan's imports of fuels, the biggest category of imports for this resource-scarce nation, fell 42 percent in July from the year before. The strong yen also has pinched exports, hobbling efforts to keep the economic recovery on track. But in volume terms the decline for both was milder: export volumes fell 2.5 percent while import volumes fell 4 percent from a year earlier, Marcel Thieliant of Capital Economics said in an analysis. "Looking ahead, we expect the yen to weaken against the dollar toward the end of the year, so the annual growth rates of export and import values should start to recover in coming months. But with external demand sluggish, trade volumes are unlikely to stage a strong rebound," he said. Japan's exports to China fell 13 percent in July from the same month in 2015, while its exports to the U.S., its biggest overseas market, dropped 12 percent, driven mainly by a drop in shipments of vehicles and electronics. The economy barely grew in the April-June quarter, as weaker exports and business investment weighed on the faltering recovery. Stronger exports, a pillar of Prime Minister Shinzo Abe's strategy for revitalizing growth, have been crimped by lagging demand. A report issued last week by the Japan External Trade Organization estimated that world trade declined in 2015 by 12.7 percent, the first decline in six years. Overall, Japan's exports fell 10 percent and imports dropped nearly 21 percent last year, measured in dollar terms, the report said. Trade has been declining overall as Japanese manufacturers shift a growing share of their production overseas, closer to faster growing markets, especially in Asia. However, exports of farm products and tourism have gained: Japan posted a net tourism surplus of 1.1 trillion yen ($10 billion) in 2015 — its first such surplus since 1962, JETRO said. But despite the recent boom in foreign visitors to Japan, tourism accounts for only 0.4 percent of the country's gross domestic product, it said.